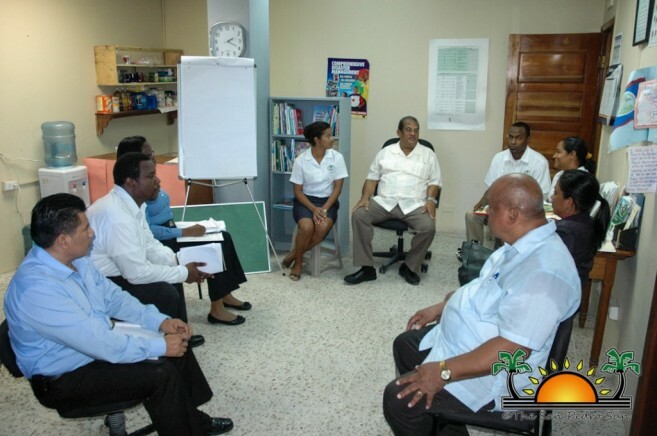 Public officers in Belize Rural South had the opportunity to engage with the senior staff of the Ministry of Public Service and Elections and Boundaries as part of a Minister’s Consultation and countrywide tour. The visit to the area is being led by the Minister of the Public Service and Elections and Boundaries, Honorable Senator Charles Gibson and his team, which included his Chief Executive Officer, Marian McNab. During the two-day tour in the area, Hon. Gibson and his team met with 105 public officers working in the various government offices in San Pedro Town, and 28 officers from Caye Caulker. In an interview with The San Pedro Sun, Hon. Gibson said that the countrywide tour started three months ago and has seen him visiting all of the districts, with Belize being the last. According to the minister, meeting with the public officers serves three purposes. “We are visiting every single government ministry in the entire country and the main purpose of the tour is three-fold. First of all, it is for us to get an opportunity to meet and listen to our public officers and hear what some of their concerns are as well as for them to raise questions if they had any queries as it relates to human resource development. Secondly it is for us to share with our public officers some of the modernization initiatives that the Ministry of the Public Service is pursuing that will perhaps impact them as public officers. Thirdly it is for us to have a physical look at the buildings in which our public officers are working in. Our Ministry is responsible for rental of government buildings and dwellings,” said Gibson. One of the common complaints by public officers is the issue of the equal quality of housing officers are subject to, as well as the high cost of living on Ambergris Caye as compared to other areas of the country. According to Hon. Gibson, living conditions along with the crime and security issue in the various neighborhoods was raised during their meetings. “We have to see how we can make public officers as comfortable as they can in the areas that they live in. Public officers who are transferred out to Ambergris Caye receive a hardship allowance. That allowance is approved by the Ministry of Finance that addresses some of the issues of high cost of living in a place like San Pedro Town. What we also try to do in some cases is that officers who are transferred get a housing allowance. 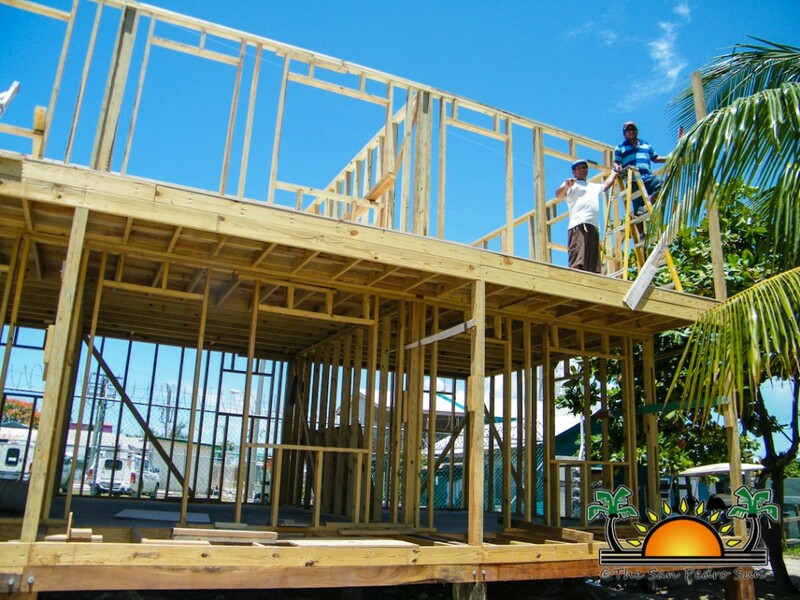 In some cases we rent a house for the public officer coming to the island and we are looking at anything above $1000 or $1200 a month to get a reasonable dwelling,” said Gibson who explained that they are looking at ways to improve that system. When asked about the public suggestion to have public offices in one centralized location, Gibson said that they are working at getting there. “What I intend to do after the tour is completed is to make a report to Cabinet for appraisal. They will look at the public officers’ concerns, their comments and recommendations that have been put forward. I have already received a number of recommendations. The suggestion was made during our tour in the Toledo District to have one administrative building that can house all the government offices. In San Pedro Town, we have some government offices located in one particular building. It would have been good to have as much, if not all, in one administrative building but certainly that is something that we will take into consideration and a recommendation for us to pursue,” he said. And while public officers’ welfare was key to the Ministers visit, he also discussed the issue of public officers’ behavior. Gibson said that the abuse of government property as well as their office power, the lack of motivation and tactfulness by public officers is also something the ministry is looking at. “The use of our government issued vehicles, in this case golf carts, is certainly something that should not be abused. I will be the first to say that there are a number of agencies that have to work beyond the normal working hours. But when we begin talking about public officers, who during the weekend are out with their family and friends drinking in government vehicles, then that is something we need to look at and address. Throughout the tour, those issues were put forward, and we will be making a recommendation to the Ministry of Finance. I must say however, that I am impressed with the work that our public officers do. Of course there are a few in the system that are not as motivated as we would want them to be, but we hope that this tour will motivate them.” The Minister said that currently the Ministry of Finance is working on a new set of regulations as it relates to the use of Government-issued vehicles which he hopes will address the problems with abuse. It was interesting to note that while the Police Department falls under the Ministry of National Security, Gibson did not exclude them from his visit. The living conditions of police officers on both Ambergris and Caye Caulker, the prime tourism destinations in the country, can be classified as the worst. In most instances the police officers have to live under seriously dilapidated plywood structures, which affect them during extreme weather conditions. 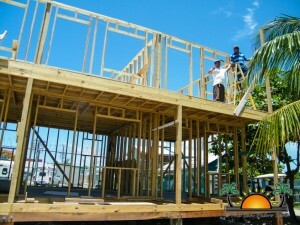 In San Pedro Town, the Police have been trying to build a barracks with help from the business community. Having little to no support from Central Government, that project is at a standstill due to the lack of funds. Gibson, through his Ministry promised to intercede and for the immediate future, has offered to finance housing for six police officers. The rest of the visiting team included Patrick Bernard - Chairman of the Public Services Commission, Marvin Blades - President of Public Service Union, Marcelino Choco - Acting Director of Human Resource Development and a secretary. The Minister and his technical team is expected to draft a report at the conclusion of his tour which will be taken to Cabinet for appraisal and for proper recommendations.